The Dashboard application installed and launched by the FRC Driver Station is a LabVIEW program designed to provide teams with basic feedback from their robot, with the ability to expand and customize the information to suit their needs. The 2014 Dashboard includes a new record and playback feature allowing you to record video and dashboard data while operating your robot and play it back onto the dashboard later for debugging. The default dashboard uses the left column for camera display. The right column has a few settings located on the bottom row so that they always present. The remainder are located within the tab control on the right. Camera configuration is summarized on the top button. Click to modify the settings details shown below. The next row indicates the frames per second and megabits per second used by the camera. The LED indicates whether this is within recommended range. The button on the bottom row enables and disables the dashboard camera connection. It has no impact on robot vision capabilities. When pressed, the camera configuration button opens a small configuration panel. These settings directly impact the network bandwidth used by the camera. Press the button again to close the panel. Resolution is selected using the top button. 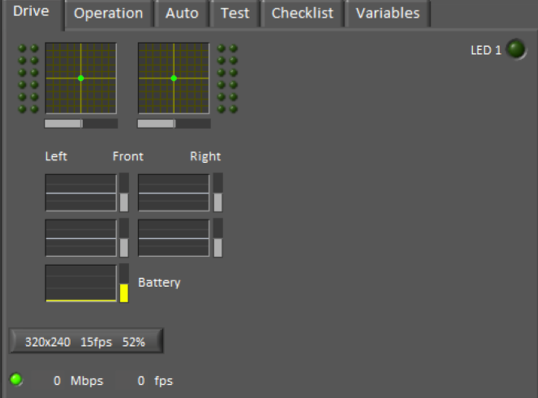 Frame rate is set using the slider on the left. 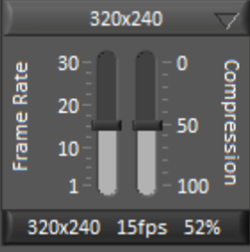 Compression is set using the slider on the right. The buttons in the lower right are used to control recording and playback of matches in the dashboard. The dashboard background color changes to help identify the mode that is selected. Play brings up a panel for selecting a previously recorded match. It also ends any recording already underway. In playback mode, the camera and other dashboard indicators are not live, but update with recorded values. Record creates a new recording session. Stop ends either playback or recording mode. The playback panel is shown when play button is pressed. The left button contains actions for renaming or deleting the selected log file. For backups or larger cleanups, the bottom action opens the folder in an explorer window. The second button displays a list of all recorded matches located in the Public Documents/FRC/Log Files/Dashboard folder. Selecting a file begins playback at the selected playback speed. The third button selects between playing and pausing the selected recording. The fourth button selects the playback speed, 1x being normal speed. 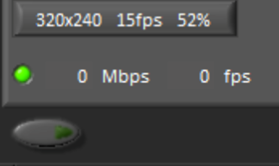 The slider on the right edge is a scrub slider that shows the current position in the playback. Click to modify the position. Pause and move the slider left or right to rapidly move through the recording. The drive tab displays axes and buttons of the first two joysticks. It contains the motor values being sent to drive wheels and the battery voltage of the robot. LED 1 is an example indicator mapped to the SmartDashboard variable named LED 1. 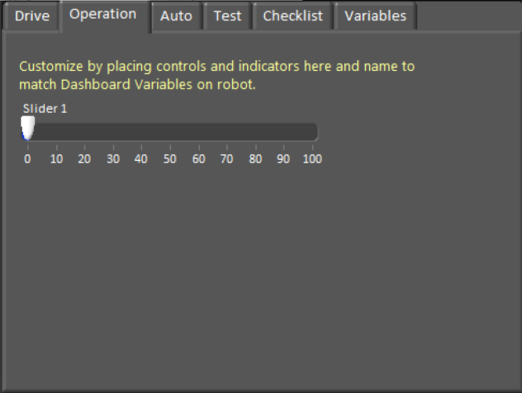 The operation tab initially contains one slider bound to a SmartDashboard variable named Slider 1. As the comment indicates, it is very easy to modify and add variable controls and indicators. 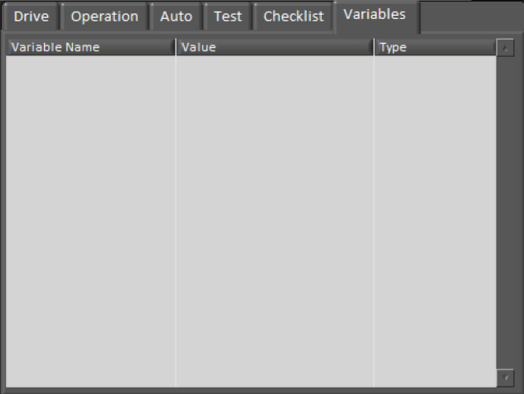 The Auto tab initially contains two checkboxes bound to SmartDashboard variables Checkbox 1 and Checkbox 2. While not limited to autonomous mode, this is a convenient place for the variables that can influence autonomous mode. 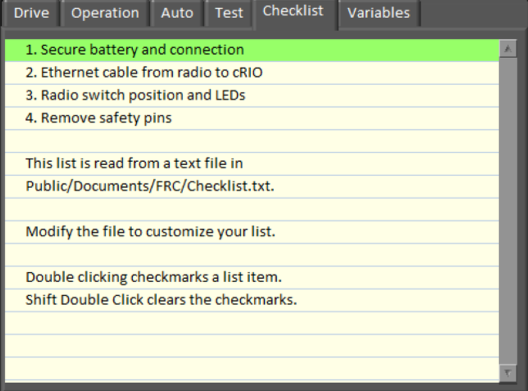 The test tab contains a table useful for testing your robot’s I/O. 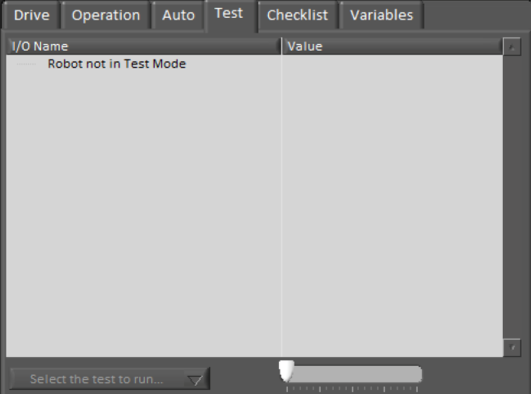 When placed in test mode, the table will list all I/O that is opened and named using the LabVIEW WPILib functions. More details on test mode are available later in this document. 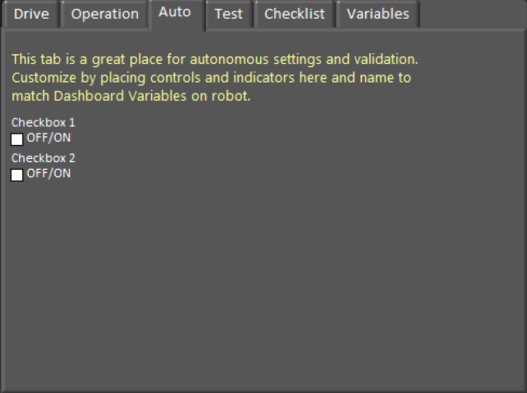 The variables tab displays the name, value, and type of all Network Tables variables on the robot.